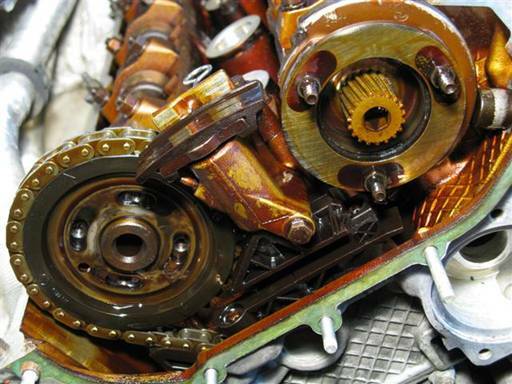 BMW introduced its first variable valve timing systems in 93. It called its variable valve timing unit “vanos”. On the standard i6 engine this was a single vanos (intake adjustment) and was initially introduced on car models E36 320i/325i and E34 520i/525i. 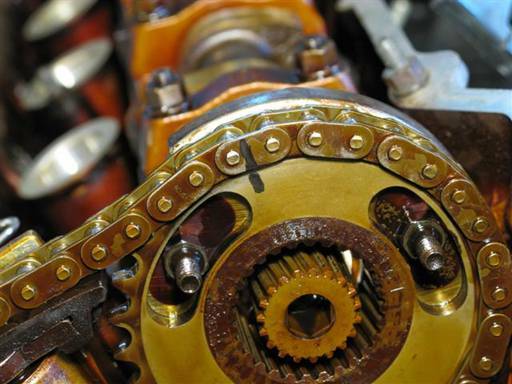 BMW soon realized its variable valve timing system was prone to a rattle. It modified the system to incorporate a diaphragm spring on the intake camshaft sprocket. The diaphragm spring dampens sprocket rotational play and thus reduces the rattle. This diaphragm spring design was incorporated in all subsequent standard i6 single vanos car models, except the Euro 328i. On March 95 build the diaphragm spring design was introduced on the E36 320i/325i/Euro 328i and E34 520i/525i. This diaphragm spring design can be retrofitted onto pre March 95 build E36 320i/325i/Euro 328i and E34 520i/525i cars. This retrofit can significantly reduce the variable valve timing system rattle. 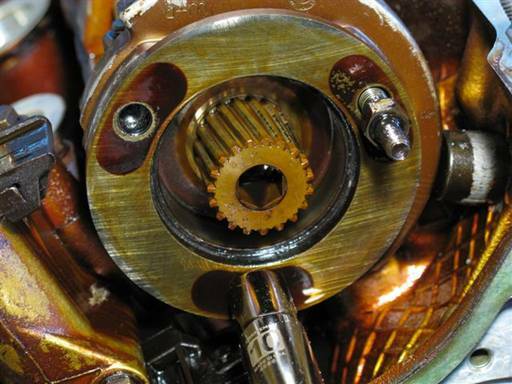 To understand the function of the diaphragm spring for reducing the rattle some understanding of the BMW variable valve timing system is needed. 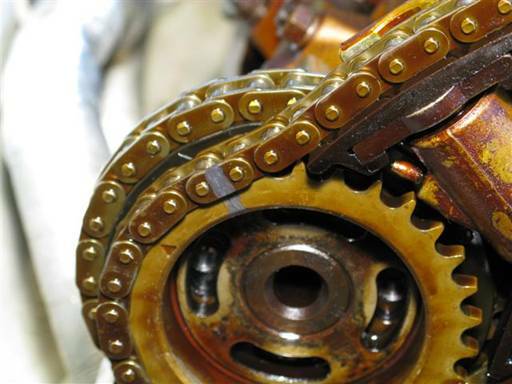 On a non variable valve timing engine the camshaft sprocket is mounted directly to the camshaft. 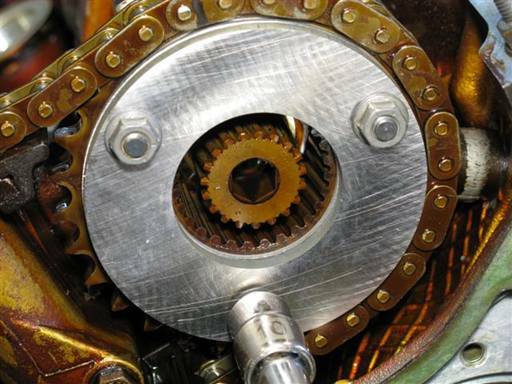 As noted above with the BMW variable valve timing system the sprocket is connected to the camshaft via the splined shaft. But this is not sufficient to fully support the sprocket. 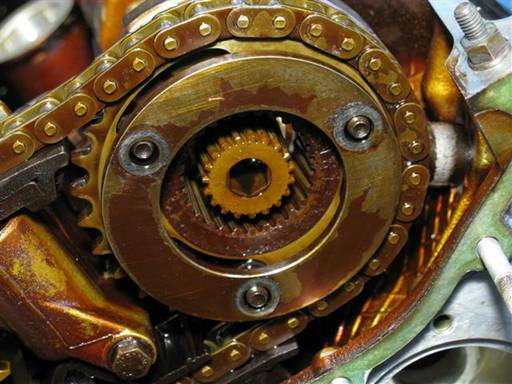 BMW devised a method to mount the sprocket on the camshaft but still allow the camshaft to rotate independent of the sprocket for variable valve timing adjustment. The camshaft has three dowels protruding axially and the sprocket has three slots along its face. The sprocket slots are inserted onto the camshaft dowels. When the camshaft is rotated for timing adjustment the camshaft dowels slide along the sprocket slots. 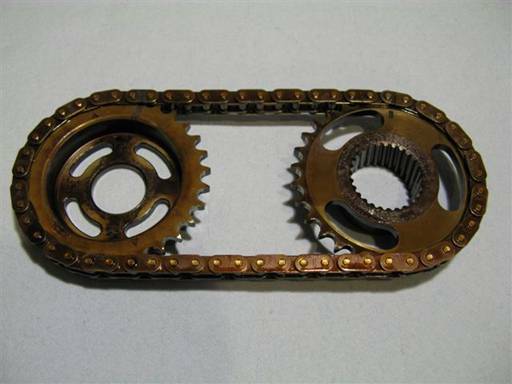 This allows the camshaft to rotate independent of the sprocket. 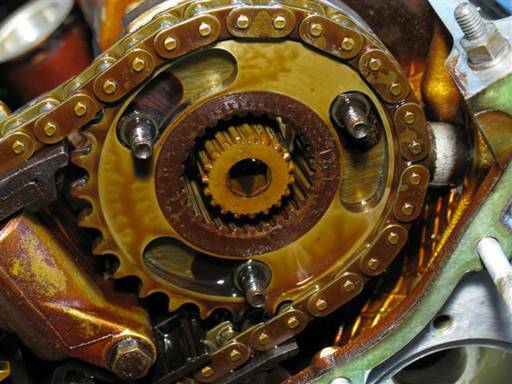 To maintain the sprocket on the camshaft dowels, stop disks are mounted at the fore and aft of the sprocket. 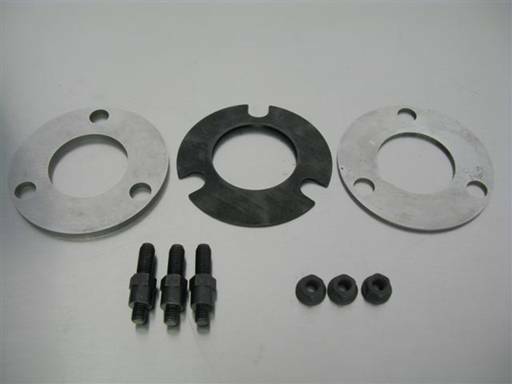 These stop disks are fully mounted on the camshaft dowels and rotate with the camshaft. During camshaft timing adjustment the stop disk faces slide along the sprocket faces. The splined shaft axial movements caused by the camshaft lashes are facilitated by the helical gear wear, but they are also enhanced by sprocket rotational play. 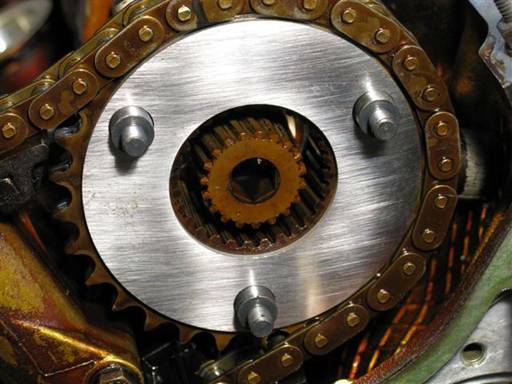 The sprocket is mounted rotationally by the splined shaft and timing chain. The splined shaft and sprocket helical gears wear and create play as noted above. 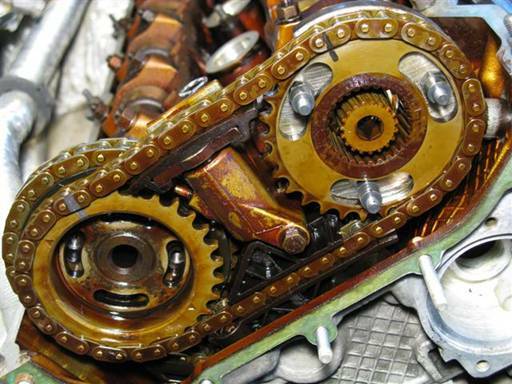 Also the timing chain has excess length. 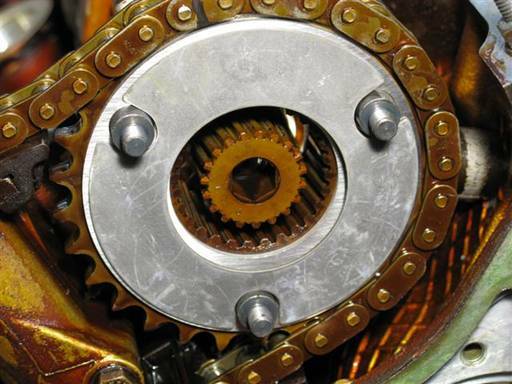 The helical gear play and timing chain excess length combine to create sprocket rotational play. When the camshaft lash moves the splined shaft axially the splined shaft also engages the sprocket. 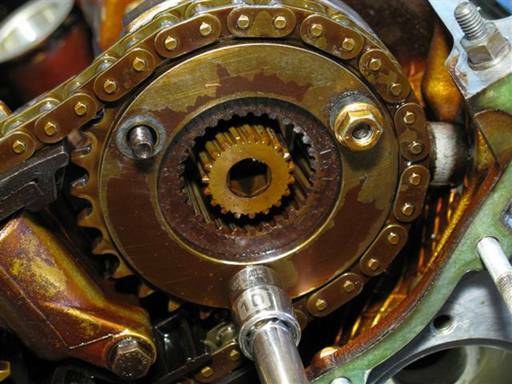 Due to the sprocket rotational play the splined shaft axial movement causes to rotate the sprocket. This allows the splined shaft to have longer axial movements. These longer movements enhance the effect of the camshaft lashes on the splined shaft. The splined shaft axial movements become stronger and more able to engage associate components play and cause it to rattle. In an attempt to reduce the rattle BMW introduced a diaphragm spring that improves the sprocket mount and dampens its rotational play. The diaphragm spring is included as part of the camshaft sprocket apparatus. In addition to the sprocket outer stop disk, a diaphragm spring (concave plate) followed by an additional stop disk are installed. When the last outer stop disk is mounted on the camshaft dowels the diaphragm spring is compressed. This causes to press the stop disks on the fore and aft of the sprocket onto the sprocket faces. This creates resistance to sprocket rotation and dampens sprocket rotational play movements. 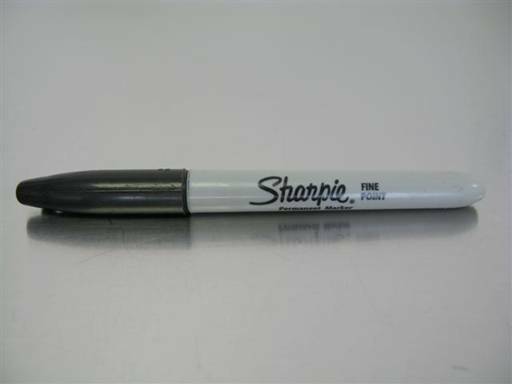 This acts to inhibit splined shaft axial movements and in turn reduces the rattle. 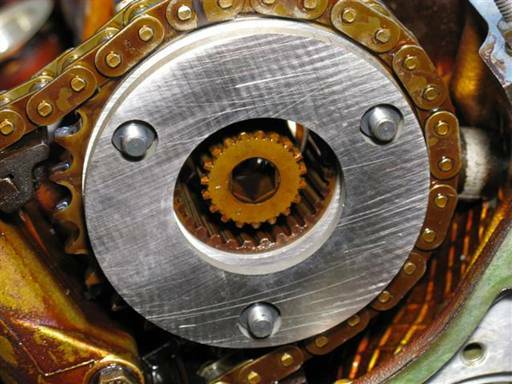 The diaphragm spring force is not excessive and thus still allows the sliding of the stop disk faces along the sprocket faces during camshaft timing adjustment. Pre March 95 build E36 320i/325i/Euro 328i and E34 520i/525i cars can retrofit install the diaphragm spring. To do this the existing camshaft dowels are replaced with longer dowels and the sprocket outer stop disk is replaced with a stop disk, diaphragm spring, and stop disk. The needed parts are available from BMW and are listed in this repair procedure. The following is a single vanos intake sprocket diaphragm spring retrofit repair procedure. The procedure applies to pre March 95 build E36 320i/325i/Euro 328i and E34 520i/525i cars. 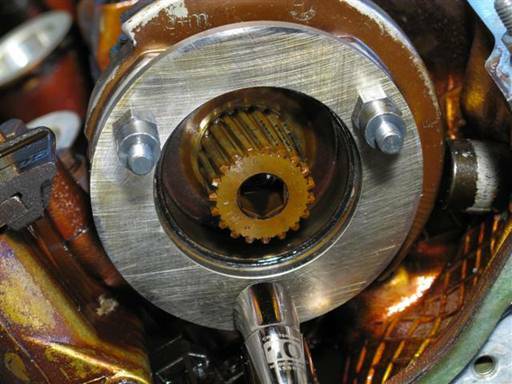 This repair should be performed with the single vanos seals repair and single vanos rattle repair. Beisan Systems does not provide any of the following parts. Note: Do not utilize nut referenced in BMW Service Information. Nut referenced supersedes to nut that does not work. Nut over tightens sprocket diaphragm spring and prevents ability to perform timing rotation adjustment. Nut listed above is from BMW ETK and works properly. 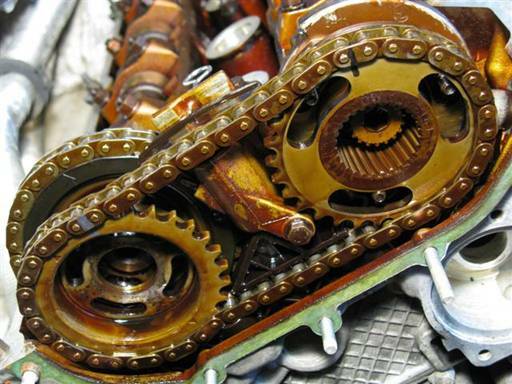 Intake camshaft must be locked per method specified in single vanos repair procedure. Insert cloth towel below intake sprocket. This will prevent any falling bolt/nut from dropping into oil sump. Remove intake sprocket 3 mounting nuts (10mm socket 3/8” / 3/8” ratchet & extension). Remove intake sprocket outer stop disk. Mark intake sprocket and chain matting at top (marker). Mark exhaust sprocket and chain matting at top (marker). Remove intake and exhaust sprockets and chain as one part. Do not disconnect chain from sprockets. Keep sprockets separated to maintain chain mount. Note: Outer disk at exhaust sprocket is missing in picture. Lay down sprockets and chain on table. Keep sprockets separated to maintain chain mount. Intake and exhaust after sprockets removal. Remove intake sprocket 3 mounting studs (10mm deep socket 3/8” / 3/8” ratchet). Note: Maintain intake inner stop disk and notched wheel on camshaft. Install intake sprocket 3 new mounting studs (10mm deep socket 3/8” / 3/8” ratchet). Fully tighten 22 Nm (16 ft-lb) (10mm deep socket 3/8” / 3/8” torque wrench). Note: Tighten studs evenly in multiple passes. Note: Verify one pass with all studs fully tightened. Note: Old inner stop disk was removed and cleaned. This is not necessary. Install intake and exhaust sprockets and chain onto camshafts. Keep sprockets separated to maintain chain mount. Note: Rotational position of sprockets is not important. This will be set when vanos is installed. Install intake sprocket new first outer stop disk onto intake studs (thin plate, 2mm). Install intake sprocket new diaphragm spring onto intake studs. Install intake sprocket new second outer stop disk onto intake studs (thick plate, 4mm). Install intake sprocket new 3 mounting nuts (10mm socket 3/8” / 3/8” ratchet & extension). 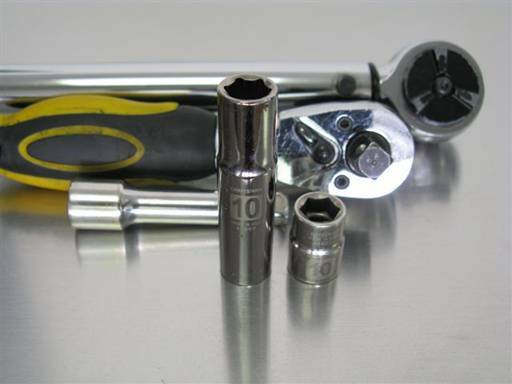 Fully tighten 10 Nm (7 ft-lb) (10mm socket 3/8” / 3/8” torque wrench & extension). Note: Tighten nuts evenly in multiple passes. Note: Verify one pass with all nuts fully tightened. Remove cloth towel from below intake sprocket.